1. Make all the edits you need to make. From what I can tell, the genius in iMovie is that it doesn't actually make permanent changes to your source video as you cut, color, and do whatever else you do to it. (My wife often wishes salons worked this way.) In fact, it appears that a project is just a list of changes that iMovie shows you while you are editing, referencing the necessary video as it goes along. 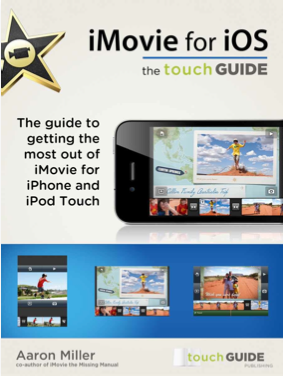 Your edits are only permanent in the videos you export from iMovie, such as to YouTube or to the Media Browser. (Hence the warning you get if you make a change after already sending it to the Media Browser.) Even then, when iMovie exports it just renders a new video file that follows the instructions laid out by your project. Because all of your edits are nondestructive, the Apple engineers decided to do away with the mundanity of saving projects. I am also confident that this explains why older machines can't run iMovie '09. All this dynamism take a lot of horsepower! The only caveat to this behavior is that your list of Undo's will be lost if you quit iMovie. Still, that is just a matter of convenience because you can always manually go back to what you had before. All in all, I really the editing method of iMovie '09. The only problem with taking the "Save" function away is for those of us that work on multiple machines. 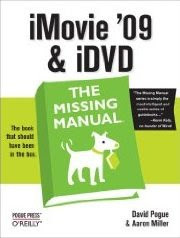 You have to locate and drop the files into the Movies folder in the user folder. That's a Pain!! Any way around it in 09? If only it were true that you don't have to save. Unfortunately, I make changes and iMovie doesn't keep them. The text in particular keeps changing back to previous versions when I reopen iMovie, but I'm also having problems with the timing of slides. Everything reverts back to whatever I started out with when I close the program. @Erika, this is not at all normal behavior. It sounds like you may have a permissions issue or some other buggy behavior. I'd recommend you run through some troubleshooting steps to see if it continues: repair permissions with Disk Utility, delete your iMovie preferences (Home Folder->Library->Preferences->com.apple.iMovie8.plist), and maybe reinstall and update iMovie. So does this mean it saves by itself? sorry but I'm totally confused, I spent 2 days editing. Had to restart my machine without rendering my movie. Does that mean I've lost 2 days work because if I have that is the worst update to a piece of software of all time. What happens if I want to go to it in a few months? @Aaron, @Erika, I've the same issue. After two days of work (and 25 minutes project well done) now imovie 09 8.0.4 refuses to add titles, photos and doesn't save any other change to project... I've just repaired permission, deleted preference, reinstalled imovie, tried other disks.... anything else before going back to sony vegas on my bootcamp partition? I've had the inability to add new titles too, when I had the issue. So, thanks to a searchs in Apple discussion forum for the last one, I've discovered the matter was the "fou corners" title. I had two of this buggy title type in my project: deleting them now all works fine!! Same trouble here w/iMovie 09 not saving in-progress changes. Never had much trouble before Snow Leopard "upgrade". Lost 4 hours of editing tonite, not even on LaCie/TimeMachine. Have to lug 20" iMac to Apple store tomorrow. Big mess. I've been researching this topic for days and find no reasonable answer. I want to "save" today's version. to that version I had last week and fork it off into something else. What directory do I copy in order to make a snapshot of the current project ? How do I leave one project, start another, then come back to some other project later ? I don't think I'll ever be able to shut down iMovie since it appears I will most likely lose my entire work. Something is missing in this picture. I don't get it. I bought Mac because Movie Maker won't let you burn a DVD. Fools. Wednesday night i spent 4 hrs editing on imovie and accidently pushed the 'Open Camera Import Movie' button.The programme closes and my movie is gone. I reedited last night , tried to save,couldn't. It was suggested that i close the programme and this should force it to ask u to save. No !!! Not only can't u save !!! The Salesman should warn . NO REWORKING MOVIES . ALL MOVIES NOT SAVED. Is there an answer to this problem yet?? I feel completely crippled after upgrading. I've redone a video 3 times, I can't spend my time doing this only to find my work gone. Yup. This is a nightmare with iMovie. I just lost edits after 14 hours. I will not be able to make my deadline now. It's 1:20 AM, I just read these earlier posts, and they've confirmed my nightmare. At least I can try and kill it without saving is my only chance. I'm sure it'll crash when I export. Thanks Apple. Still no answers on this problem from Apple, or on any of the Apple support forums where it is discussed as well. I don't think there is any way to recover the lost work, BUT, a tip for those who are worried about using iMovie again before the bug is fixed: I have read suggestions from other users to "always" click the "done" button when adding/changing a transition or title. Disclaimer: I'm not sure if this is at the root of the problem, but thinking back on the work I lost I can confirm I often adjusted transitions without clicking the "done" button.... its just a guess but that may be one reason iMovie is failing to write the changes into the project file. Again, just a guess but *so far* I have been clicking the "done" button religiously and the bug has not recurred (yet) :-) Good luck everyone! The software is a piece of crap, but it's free, comes with the Mac, so what do you expect? The lack of a 'Save As' option is very typical of Big Brother Apple (the first company to sell computers with cameras to watch you installed). I'd used PC's for years, then switched to Mac, and so far have found them very, very similar - crashes, bugs, the whole bit, but at 1-1/2 times the cost. there is a round about way to save your work as you go along or make multiple versions of the same movie. Go to the projects library. Go to file menu and Select "duplicate project"
you can right click on your project and select "duplicate project as well"
give it a name. You now have 2 identical copies of the same project. You can edit and change one and the other will not be altered. It is kinda like a pseudo "save as"
I DID THAT AND I LOST EVERYTHING I DID!! I the same problem but it happened after I upgrade mac to snow leopard, all the previous projects made with 10.5 are still visible. IMovie just crashed on me and when I opened it back up, it brought up my last project, not my current. After freaking out for a little while and reading this post, I clicked on project library on the top left. Since my most current project was named when I created it, I scrolled and found the movie I was working on. It might just be as simple as finding your project in the project library. Worked for me. When I used imovie, I worked on a movie for a while and then left it and came back and it was fine, but when I went back in and made changes it didn't save. I had to go back in again and make the same changes. Are you having the same problems? It saved the movie changes after that, but I am afraid to exit out because I don't want to lose my work! Is it possible to blow out iMovie '09 and replace it with '06 which seems to be the last adult video editing program in iLife? I just bought an iMac, looking forward to good work on the big window, and find that iMovie won't import a sound track. Isn't this fundamental? Has Apple switched from supporting video geeks to pandering to thirteen year-olds putting rubbish onYoutube? I had no problem in iMovie '08, it automatically saved the movie, but now having installed iMovie '09, the program refuses to save the Project, though it keeps the Event. It's not a matter of losing the project name--it just doesn't contain any of the work! I stopped being able to save my projects to, but I seem to have worked around this by just adding a a still frame to the project before quiting... It somehow forces the saving of the project, it's not a pretty but has been working for me so far. Same with Snow Leopard. Just spent 4 days editing and now have lost everything. Tiger was so good - I edited and made so many Home movies and now this so called new upgrade is totally frustrating. I'm thinking of buying some different software just to get the job done - not impressed at all actually. APPLE have stuffed this up. I am comforted in the knowledge that I'm not the only one that has been burned by this APPLE stuff up. I had trouble losing work when i first started, before I realised that the project window is only a list of links and instructions, the event window is where the raw movie is stored so that is sacrosanct, don't delete or move anything there. The only save as function available is as one of the export options which renders the work, not ideal since it does not back up the project in modifiable form. However now I have done about 20 small projects (see 'barreboy' on Youtube) iMovie seems to have become stable and I haven't lost any work, touch wood. I have a quick question: after you export from imovie, can you go back to the project and edit it as necessary? Does it stay final after you export it? After you export it you can still edit the project but it will have a sign on it saying 'modified, you must export again'. The projects are unstable, period. You are lucky if you find your project as you left it after closing and reopening. To "save as..." in iMovie: Click on project Library, and you see a list view with "icons" of all the project files in your Movie->iMovie-projects folder. Right click on any project and enjoy a juicy menu that includes Duplicate. You can even delete a project from here! This is the first google page I came across having encountered this problem and I was looking for a solution. Upgraded to 8.0.6 and I am pleased to say that this problem appears to be gone now. I was having exactly this issue in relation to titles. I would make changes to the fonts/colors and afterwards, when I quite iMovie, all those changes would have been lost on reopen. I went through this several times over and lost the changes every time, exporting the movie beforehand just to have a backup. I tried following Dave's advice to ALWAYS click the "Done" button no matter what, whenever I had finished making my changes to a particular transition or title, and that seems to be a crucially important action that saves your work. Having done that, when I close iMovie and open it back up, now all my edits are properly saved. when exporting to you tube or saving on disk,the transitions are gone ...only the themes and effects remains. Apple help desk can't help. Ok, I can't believe this has been going on so long. But here is what I discovered. DON'T Change any of your Project Properties at the start. Start with the default. It should save fine. This is definitely a bug. I only discovered it because I haven't used iMovie for that long. I was able to create a movie a few weeks back. But the movie I was working on today, wouldn't save. The only thing I did different was modify my project properties to automatically add a transition. Was just trying to be more efficient. We're on Snow Leopard with iMovie 09 and have had all of the problems listed in this post. After working on a project for 8 weeks, we were 5 minutes from being completely finished. Unfortunately, I hit "Undo Trim" to undo a trim and the entire Project Library froze. It has not exported to any form and it will not allow editing, it will play the movie if I hit the Space Bar. All I want now is to be finished. Apple ought to be ashamed of itself to let these problems go on for so long. Hi, not much help to peoples with bugs, but I'm old fashioned and love to save copies of everything I do, I call it good working practice. Anyway, if you go to your 'mac' > users > 'your mac' > movies > iMovie Projects folder there's the small compressed files with your project titles that have the code and stuff (not the footage), only under a meg. I copy them to another folder as backup against files being overwritten by accident. I am having the same issue and I have Read/Write permissions in all of the areas suggested. So that's not it. Wish it was. I am mad about all the time I wasted. I opened up my iMovie software to find that half of my projects were gone! Interestingly enough the ones that were missing had clips on them from our new Sony HD camera but none were missing that had clips from the FLIP or the old non HD Sony camera. The projects are not in the trash or anywhere to be found. Random: Hi, I have to create a short film for work and came across this problem. I tried the duplication thing, didn't work. I tested difference between creating a new project and not giving it a name ie just using 'New project 1, 2 etc' versus creating new project and naming it. For some bizarre reason, not giving it a name seems to work for me - whatever transitions I applied were saved, even when I close iMovie and opened again. Very weird. But I hope this helps someone.